When it comes to your skin, there’s more than a few things that can go wrong! This is not something that you want to “Do it Yourself” and diagnose with “Dr Google”. If you are looking for a Podiatrist in Pittsburgh with over 21 years of experience looking skin diseases of the foot and lower leg, Dr Christina is the one you want. Many skin disorders of the foot are great mimickers. This means they can superficially to an untrained eye look very similar, but in reality the infecting organism and the treatment may be very very different. This is why you want a doctor specializing in skin of the foot to evaluate your foot problem and recommend the best course of treatment. Here a just a few of the most common skin diseases of the foot, according to Dr Teimouri DPM, Podiatrist Moon Twp, and what she sees commonly in her Moon and Cranberry Twp Podiatry offices. Abscess – Infection in the soft tissue areas inside the foot. It is caused from a collection of pus and also often has pain inflammation and swelling. Actinic Keratosis– these are rough scaly patches of the skin often seen on the front of the lower leg, also called age spots, can turn into skin cancer, so should be monitored by your podiatrist. Allergic Dermatitis– An example of this is poison ivy. Allergic Dermatitis is when the outer layers of the skin become inflamed by an irritating substance that touches the skin. Some people are allergic to fragrances, soaps or laundry detergents in their clothes that rub the skin , for instance at the ankle from socks, possibly nickel or metals in bra hooks or earrings. Manypeople have reactions to medications, for instance toenail fungus medicine that causes red itchy rashes on the toes from improper application. Athletes Foot – One of the most common conditions on the skin of the foot that a Podiatrist in Beaver sees every day. From Teenage athletes to runners to our aged veterans athletes foot is omnipresent. Athletes foot is a fungal infection of the skin of the foot. It is EVERYWHERE! And it loves the warm dark moist sneakers that are worn all day. There are two common types of athletes foot infections; Acute athletes foot and Chronic athletes foot. Acute athletes foot has red little pimples or blisters and are red , itchy or burning. this is found between toes, on the bottom and sides of the feet and can even creep up your legs. In older athletes, or vets who suffered trench foot in the war, the condition is often Chronic. Tis appears as dry scaley feet, sometimes white and scaling. Often the chronic athletes foot is mistaken as dry feet and can cause very painful cracked heels. Basement Membrane – Thin membrane that attaches the layers of skin tissue to the body. for example a plantar wart does not cross the basement membrane of the skin. – Caused by nail trauma where it turns black from fungus, a bruise, too-tight shoes or cutting a nail too short. Bruise – Occurs when tiny blood vessels or capillaries rupture inside of the soft tissue body structures and appear blue, purple or dark red. They can appear anywhere on the body. Bones may also be bruised but you need an MRI or CT scan to assess that. “My problem began as a blister on the ball of my right foot; and I really didn’t think much about it until it started bleeding. Eventually, it got infected and began leaking fluid, so I went to my primary doctor, who put me on antibiotics, which didn’t help. In the meantime, as the owner of a pizza shop, I still had to work 14 to 15 hours a day, spending most of that time on my feet. So, at one point, I decided to try drying my feet by putting them up by an electric heater; but, because my diabetes has affected the nerves in my feet, I couldn’t feel how hot it was, and I ended up with burns and blisters on my toes. So, I went to Dr. Tina, and she’s working miracles with a treatment that started healing very rapidly. In fact, I was surprised at how fast the skin on my toes started growing back; and she’s also successfully treating the original wound on my foot with a very effective antibiotic. Dr. Tina is really doing a fabulous job, and I have a lot of respect for her! Callouses- Corns and calluses are among the most commonly treated foot conditions. Corns are the thickening of the skin on its outer layer around the toe’s tops, where calluses are similar condition but on the bottom of the feet. These conditions are caused from pressure and can be painful. Can be removed by your podiatrist with a scalpel, don’t try this at home! Be careful applying over the counter corn pads to between the toes, or anywhere if you are diabetic, it can lead to disaster. Contusion – A bump or a bruise or an injury involving the skin but does not tear it. Corns– Corns and calluses are among the most commonly treated foot conditions. Corns are the thickening of the skin on its outer layer around the toe’s tops, where calluses are similar condition but on the bottom of the feet. These conditions are caused from pressure and can be painful. Can be removed by your podiatrist with a scalpel, don’t try this at home! Be careful applying over the counter corn pads to between the toes, or anywhere if you are diabetic, it can lead to disaster. Foot condition in which the bottom half of the heel is thickened and/or cracked. For most, this is a cosmetic issue, if the dryness continues for long periods of time, it can lead to more serious medical problems. Can be indicative to tinea pedis (athletes foot) and may respond to topical antifungals.- This is after one treatment. Dermis – The thick connective skin tissue located directly below the epidermis. Diabetic Nail Care and Exams – Because of reduced blood flow or nerve damage in the feet, individuals with diabetes are prone to many complications, including foot infections. If left untreated, these infections—some of which begin as just cuts or blisters—could lead to potentially serious consequences, including foot, toe, or even leg amputation. Dry Cracked Heels – Foot condition in which the bottom half of the heel is thickened and/or cracked. For most, this is only a cosmetic issue, however, if the dryness continues for long periods of time, it can lead to more serious medical problems. Can be indicative to tinea pedis (athletes foot) and may respond to topical antifungals. Foot odor– Corynebacterium is a common cause and creates a terrible smell as it releases Sulfer compounds. Anyone spending long hours in hot sweaty boots is at risk- our military, farm workers, football or soccer players. Your Podiatrist will most likely prescribe a topical antibiotic and recommend antiperspirant be applied to the feet after your daily shower and washing with an antimicrobial cleanser. ( see hyperhydrosis). Foreign Bodies – An object inside the body that is not generally supposed to be present. Fungus nails– Toenail fungus can be very embarrassing. Fortunately, there is laser treatment available for this condition. Laser treatments for toenail fungus removal were first approved by the Food and Drug Administration back in 2010. Health care professionals at Beaver Valley Foot Clinic can use several types of lasers to remove the toenail fungus. Laser treatments are popular for toenail fungus removal because they destroy and heat the harmful fungi, but they keep the healthy tissue intact. Arthritis. It’s caused from diuretics, increase intakes of purine and/or elevated weight loss. Side effects include mild to intense pain of a joint. Hand foot mouth disease – (coxsackie virus A16), low grade fever and Malaise then mouth sores that turn into blisters, then soles of the feet and palms sores develop about 2 days after the mouth sores. Usually in late summer, early autumn. supposedly cures pain, illness or a minor problem. Hyperhidrosis – Condition in which one excessively sweats in or around the feet. Patients with anemia or hyperthyroidism usually experience hyperhidrosis. If this becomes a problem and a patient is uncomfortable, there are several treatment options available including antiperspirants, oral medications, Botox and surgery. Chronic condition where the edge of the toenail (typically the big toe) grows into the skin. Symptoms include redness, pain, swelling, itchiness and infection. Ingrown nails– Painful inflamed ingrown toenail borders, if not treated in time can get very infected. See your Podiatrist at the first signs of pain and redness and don’t attempt to dig it out yourself, especially if you are diabetic. Laser – Acronym for the Light Amplification by the Simulated Emission of Radiation. 27 different lasers, each best for a certain treatment available in our offices! Laser Hair Removal – If you’re tired of the cleanup, nicking your ankles or knees with a razor, try permanent hair reduction. – Treatment that involves extremely high heated, targeted light beams to remove tissue in a non-invasive procedure to remove lesions. chronic. Acute lesions last a short amount of time and are characterized by swelling, pain, heat and reddening. Chronic lesions occur more often but less accessible. – Lyme disease is caused by infection with the spirochete (spiral-shaped) bacteria species Borrelia Burgdorferi. single, bullseye shaped lesion signals a new, highly localized infection. Further rash progression indicates that the infection has become system-wide. Once the rash is observed blood testing should be done as possible so treatment at once. Lyme disease is a serious condition. It may ultimately involve the skin, eyes, heart, joints, and even the nervous system. Blood testing is the only definitive way to diagnose borreliosis. It is sometimes correctly diagnosed based on signs and symptoms, however (more on this later). Preventing tick bites is the primary way to prevent the disease. Many of the more serious complications of late stages Lyme disease can be prevented with aggressive antibiotic treatment during the early stage. This is why early detection is so important. Malignant Melanoma – The most dangerous and concerning type of skin cancer. Melanoma numbers are increasing, especially in women under 40. Typically found on the legs and back. Metatarsal Problems/IPK – Metatarsal problems occur when one wears shoes that lack support and the proper padding, or are too tight and narrow which causes pain when walking and running. IPK occurs when severe calluses on the bottom of the foot develop. – Fungal nail disease in the bed or plate of the nail. Pitted Keratolysis– ( from warm damp feet), Bacterial infection with characteristic “pits” with whitish skin . This is a common cause of smelly feet. The skin infection is found on the outer layers of the skin. Corynebacterium is a common cause and creates a terrible smell as it releases Sulfer compounds. Anyone spending long hours in hot sweaty boots is at risk- our military, farm workers, football or soccer players, any one immunocompromised or with diabetes is also at risk. As it progresses, clusters of small pits can come together as large cratered pits. Your Podiatrist will most likely prescribe a topical antibiotic and recommend antiperspirant be applied to the feet after your daily shower and washing with an antimicrobial cleanser. ( see hyperhydrosis). Plantar – Refers to the sole of the foot. Plantars Warts – Warts are a skin infection from human papillomavirus (HPV), the most common skin viral infection. Plantar warts grow on the sole of the feet, or the plantar surface. They tend to be on an area of friction and pressure. HPV only infects the superficial layer of skin, creating callus-like growths. Plantar warts– At Beaver Valley Foot Clinic we offer Laser wart removal which is a kid friendly alternative to painful scarier options. Laser treatment for warts is well tolerated by even very small children (and big babies!). Combined with special acid to treat warts, the treatment time is cut down considerable. Psoriasis – Common chronic autoimmune skin disease that causes irritating itching and redness with heavy, red flaky skin and/or thick white patches. Can often be found on the soles of the feet, knees, elbows, scalp. May also be associated with thick pitting of the nails and even athritic changes to the bones. Raynauds Syndrome– autoimmune condition involving vasospasm of the capillaries of fingers and toes. Sebaceous Cysts– benign tumors containing sebum and other materials, removed if symptomatic. Seborrheic Keratosis– Damaged keratinic plaques on the outer layer of skin usually caused by skin damage as one ages. Shingles– Herpes Zoster virus, lies dormant in the spine after chicken pox, can reactivate as a painful rash anywhere on the body, including the foot and leg. Sole – The bottom of the foot. – Spider veins, usually a precursor to varicose veins, are thin red and blue lines that can show up anywhere. They are veins, usually located on the legs and ankles, that have become enlarged, twisted, and swollen. When the valves in your veins become weak, blood can pool in your legs, causing pressure and red, blue, or purple lines throughout your legs. If they are left untreated, they can become a serious medical condition. Our lasers can treat your spider veins. Sweaty Feet – Condition in which one excessively sweats in or around the feet. Patients with anemia or hyperthyroidism usually experience hyperhidrosis. If this becomes a problem and a patient is uncomfortable, there are several treatment options available including antiperspirants, oral medications, Botox and surgery. Tattoo removal – If you’re tired of a particular tattoo, for whatever reason, try turning it into invisible ink, we have the premium choice for any color of tattoo removing. Toenail Fungus – Condition in which the nail develops a yellow-white spot under the tip of the toenail, eventually causing major discoloration of the nail and ultimately causing it to thicken and decompose. Varicose Vein – Varicose veins are very common, in fact, as many as 60 percent of people have them once they reach a certain age. They are veins, usually located on the legs and ankles, that have become enlarged, twisted, and swollen. 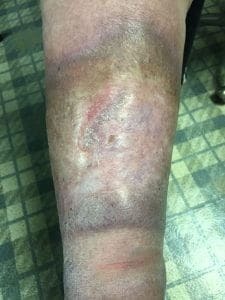 Varicose veins are usually darker, purple-blue lines found on the legs. When the valves in your veins become weak, blood can pool in your legs, causing pressure and red, blue, or purple lines throughout your legs. Warts on the Foot– At Beaver Valley Foot Clinic we offer Laser wart removal which is a kid friendly alternative to painful scarier options. Laser treatment for warts is well tolerated by even very small children (and big babies!). Combined with special acid to treat warts, the treatment time is cut down considerable.